The good news is that Righteous Kill is not a total embarrassment. The bad news....this is not a good movie. I'm a big fan of Robert De Niro and Al Pacino. So it's been hard to see their level of craft diminish throughout the years. But the truth is it's inevitable. Like a superstar athlete, skills and motivation eventually diminish. Yet for whatever reason fans are less forgiving of actors, as if the physical and mental demands are less strenuous for a performer. I understand when successful actors do projects simply for the paycheck. Still when a project has the caliber of talent assembled here, it is an extreme disappointment when greatness is not achieved. The movie is just a mess. The script is reminiscent of a movie of a week, or a direct to DVD thriller. The direction by Jon Avnet is competent, yet uninspiring. There is simply not enough meat and support for the players to sink their teeth into. Not that it would matter anyways. What I've noticed in Robert De Niro's recent work is that he doesn't seem to have any joy left in his performances. The passion seems to be gone for him. In my opinion his last good artistic endeavor was a film that he directed The Good Shepherd. Everything else seems like it's a paycheck for him. Al Pacino's case however, seems to be different. One can tell that Pacino still enjoys to act. The problem of late for him has been his choice of projects. I believe that Pacino has been hurt by his inability to find movies which are age appropriate.He is 68 years of old, so I'm sure the roles are limiting. Also since working with Michael Mann on Heat and The Insider he hasn't worked with a talented director who is able to challenge and inspire him. Perhaps he feels that he can create a good film just with his natural talent and presence. In my opinion, his last good performance was in The Merchant of Venice. Obviously a theater rat like Pacino would be hard pressed to screw up the Bard. 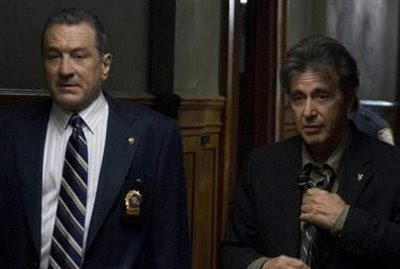 Righteous Kill is not entirely awful, it is a little fun to see the actors work together after all these years. It gives the audience a glimpse of potential. For me, I kept imagining a movie written by David Mamet. Something where Pacino and De Niro could just depend on the dialogue rather than something physically and emotionally demanding. They both have had histories with Mamet. Pacino with Glengarry Glen Ross, De Niro with The Untouchables and Ronin. But this isn't Mamet...far from it. The twist in the film is so obvious it's laughable. The explanation is pathetic. Without giving away too much...it's just not good...that's the best thing I can say about it. My final recommendation would be to just wait for the DVD. But if one is inclined to check it out in the theater, I guess it would be a harmless diversion, just as long as one doesn't expect much. Heck it might even be a good thing. A successful box office return might even inspire Pacino and De Niro to work with each other again. Maybe on something more worthy of their talents.